This part of the Go Bookshelf tutorial shows how the sample app stores its persistent data in a MongoDB database. Replace localhost with the external IP address address of your MongoDB instance. This is the external IP that you noted in the earlier section. You can also find the external IP address by running gcloud compute instances list. When a user fills in the form and clicks Save, the following code handles the form's HTTP POST /books action. 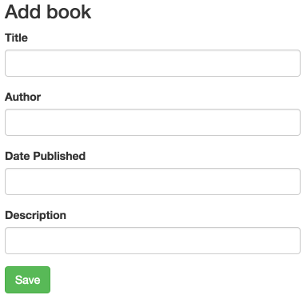 The code inserts the new book into the database by calling the bookshelf.DB.AddBook() function. The AddBook function, defined in db_mongo.go, performs an Insert() operation to add the user's submitted data as a document to the MongoDB collection. The statement db.c.Find(nil) creates a query that selects all documents in the collection. The query includes .Sort("title"), which specifies that the results should be ordered alphabetically by book title. The query is executed by calling All, which appends all the returned documents to the result slice.